Most of my posts lately have been about either food or going out so I thoughtId combine the two. What prompted this blatant mixture of styles I hear you cry? Well we are in the middle of a heat wave so we are spending the afternoons in the garden, right next to the ice cream freezer!! It’s Saturday and so thoughts inevitably turned to alcohol and I thought well, we are right next to it, it would be rude not to wouldn’t it? Now most coke float recipes call for you to put the ice cream in first but for god sake don’t…there is alcohol in this baby!!! 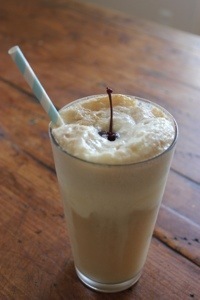 Simply mix your drink in a big glass with no ice, plop the ice cream in the top, Add a cherry and a straw and enjoy….